In 1872, former California governor and business tycoon Leland Stanford hired the English-born photographer Eadweard Muybridge to settle a bet as to whether all four feet of a horse were off the ground when trotting. (They are.) Just between 1883 and 1886, Muybridge made more than 100,000 images analyzing animal and human movement, utilizing multiple cameras, at speeds that were imperceptible to the human eye. His 1899 classic, Animals in Motion, remains in print. Locomotion is not the same as movement. All animals move but locomotion is the progression from one place to another. Locomotion enhances the animal’s success in finding food, reproducing, escaping from predators, or departing from unfavorable habitats. Locomotion can be either passive or active: In passive locomotion, the simplest and most energy efficient type, the wind and waves provide the transportation. Active locomotion requires an energy expenditure to overcome such negative forces as friction, drag (resistance), and gravity, and animal body designs have evolved to expend the least energy in active movement on land, air, or water. Terrestrial locomotion includes walking, running, hopping, and crawling, in which the animal expends energy overcoming inertia, opposing gravity, and maintaining balance. To maintain balance when walking, bipedal animals keep one foot on the ground, while mammalian quadrupeds keep three feet grounded at any one time. Aerial locomotion—flying and gliding—is utilized by insects, birds, and bats, and was used by the pterosaurs (flying reptiles extinct for millions of years). The challenge for flying animals is overcoming gravity and air resistance; energy expenditures are minimized by the shape of the wings that maximize utilization of air currents to remain aloft. Aquatic locomotion—swimming and floating—requires overcoming water resistance. Fast animal swimmers are benefitted by their streamlined fusiform bodies, which are tapered at each end. The efficiency of each of these modes of locomotion has been analyzed by comparing their relative energy expenditure. Swimming was found to be most energy efficient, with running least so and flying intermediate. Regardless of the mode of locomotion, small animals expend more energy/unit of body weight than large ones. SEE ALSO: Fish (c. 530 Million BCE), Birds (c. 150 Million BCE), Animal Migration (c. 330 BCE), Sliding Filament Theory of Muscle Contraction (1954), Energy Balance (1960). A phenakistoscope was an early animation device that, when spun, gave the illusion of depicting motion. 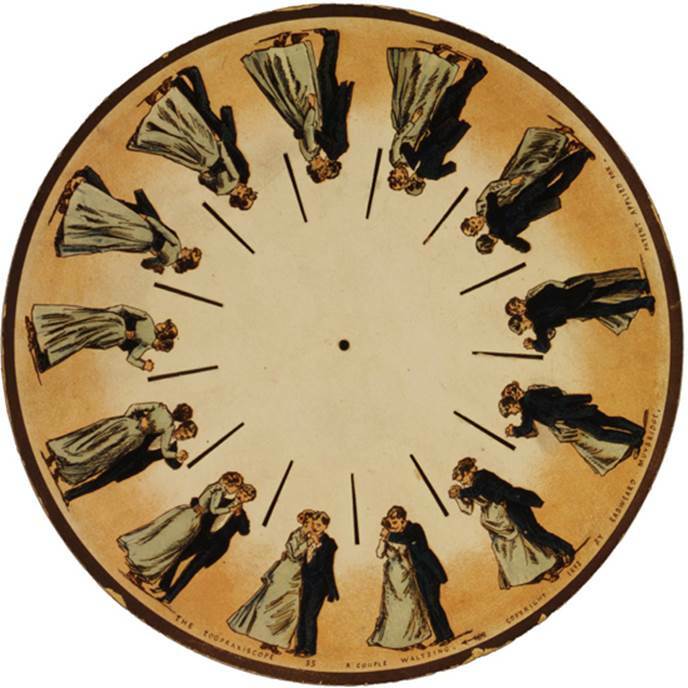 In about 1893, Muybridge prepared this phenakistoscopic disc, which provided the very realistic illusion of a couple waltzing.